The ‘Father of Aged Sushi’ at Sushi Kimura pushes the boundaries to serve sushi and small plates cuisine, opening customers eyes to non-conventional fish varieties and exciting new combinations that will tantalize even the most trained of sushi palates. Tucked away in the suburbs of Tokyo, you cannot find any more local or seasonal than this. 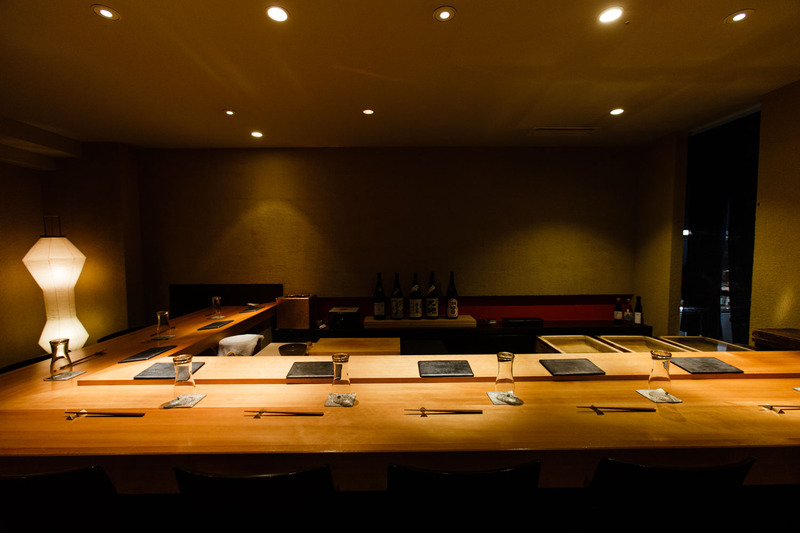 Virtually impossible to get a seat, Chef Kimura has offered seats to TABLEALL only for non-resident foreign nationals visiting Japan, who would otherwise not have the opportunity to enjoy this unique sushi experience and philosophy. Futako-Tamagawa is less than 20 minutes from Shibuya by train, but has a distinctly suburban feel. With shopping centers and restaurants everywhere, the area thrives with locals every day of the week. Wandering on the street level about five minutes from the station, there is an apartment building just a short walk from the public elementary school. It’s a relatively busy street, and yet the restaurant is so inconspicuous, you really must be searching to find it. The sandy stucco walls hold a simple ecru noren hanging adorned with the words for ‘Sushi Kimura’. The traditional Japanese characters selected for the restaurant’s name are steeped in meaning: the first one indicates joy, and the second refers to a rural village, expounding Kimura’s philosophy of finding joy in the local. 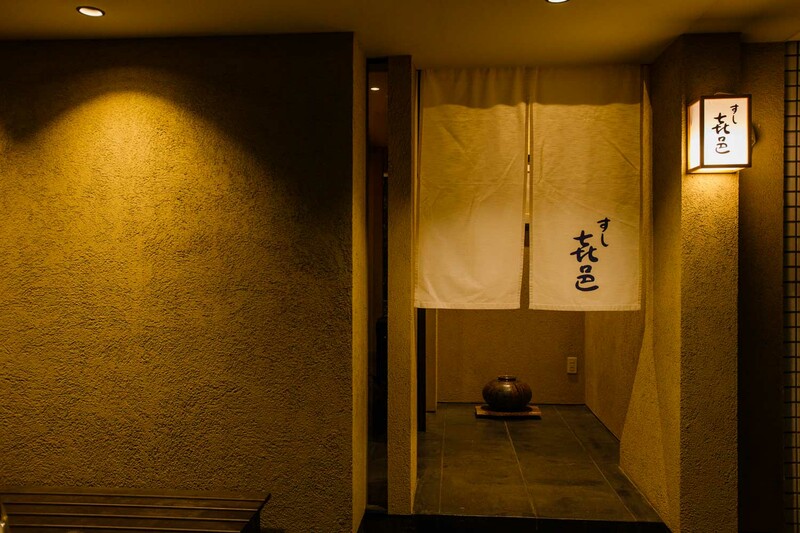 Through the entrance, past the rotund earthenware pot, you walk into a comfortable and spacious room to find the gentle and warm smile of Chef Kimura. He stands behind the sunken counter where nine guests can be entertained as he prepares their course. The course begins and dish after dish reveals the love and labor that Kimura invests to please his customers. A journey through sushi bites and appetizers, the depth of flavor is unmatched. This is a sushi experience like no other. And because Kimura simply will not serve something that is not in peak season, every dining experience at Kimura will be new and eye-opening. You won’t find maguro tuna or gizzard shad here; don’t be surprised if you have never heard of or tasted most of the fish before. The appetizing small plates are delicious with a glass of your favorite drink, and it is through these dishes that Kimura shows his more playful and innovative side. Collaborative events with chefs of Italian, French and other cuisines have inspired him to incorporate ingredients like olive oil. Careful not to stray too far off-course, however, you won’t find any truffle here. From the start, it is clear that Kimura is focused on showcasing not only the delicious flavors, but also the textures of the ingredients. 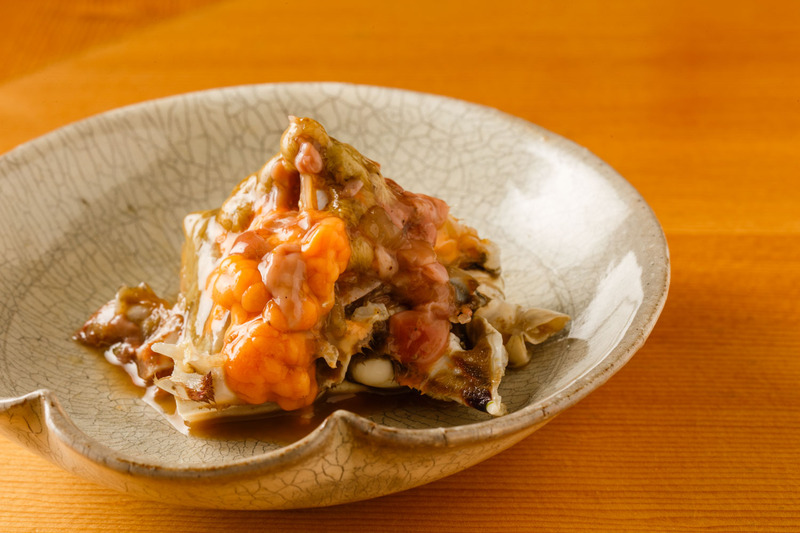 Plump innards sit atop the briny dish of crab in salted and fermented crab viscera, followed by the delectable mouthful of deep coral-colored sakura shrimp miso paste. Made by roasting live shrimp and pureeing them shells-on, the mixture is then strained three times before being combined with seasonings including miso paste. Next, a pale green glass decorated in a rice sheath design arrives, filled with a creamy white liquid and topped with the fresh green hue of olive oil. 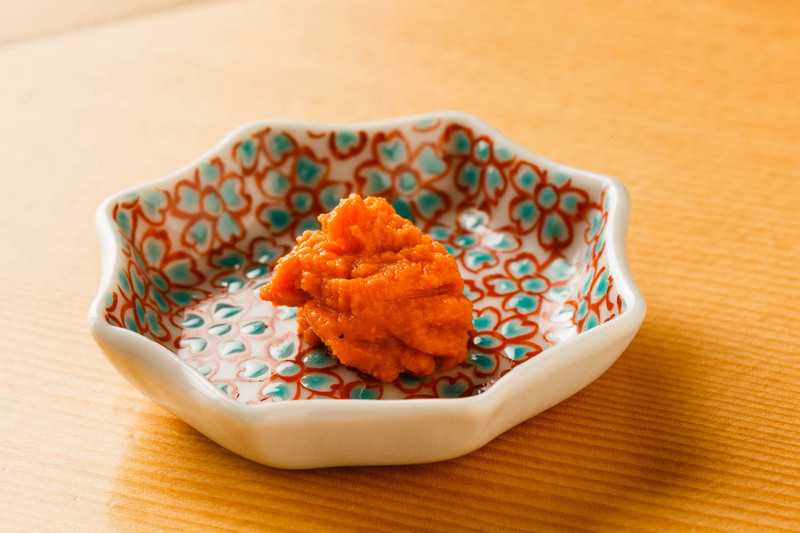 This is the soft cod roe of isaki threeline grunt fish, which has been slow cooked at 58°C for three hours and pureed. It is velvety and luscious and leaves you wondering why you have never experienced this before. Sea urchin features next, but again, in a surprisingly new form: the sweet, creamy uni flesh has been pickled in the internal organs of the sea urchin creating a translulent gelée coating. And then the nigiri sushi begins. Aged swordfish nigiri is made from a 10kg block of flesh that is lovingly tended to over 50 days resulting in just 1.2kg of perfectly matured sushi. 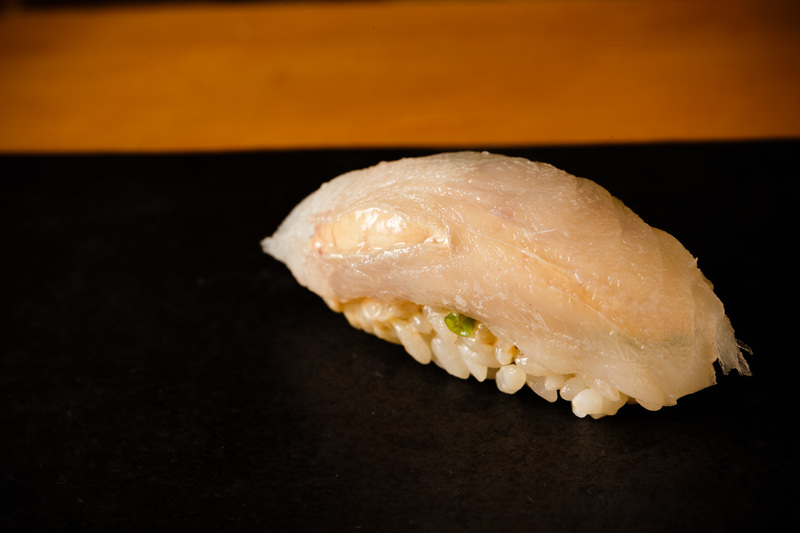 Thinly sliced steamed abalone envelops an oblong of rice, striking with its milky color and contrasting thin black edge. 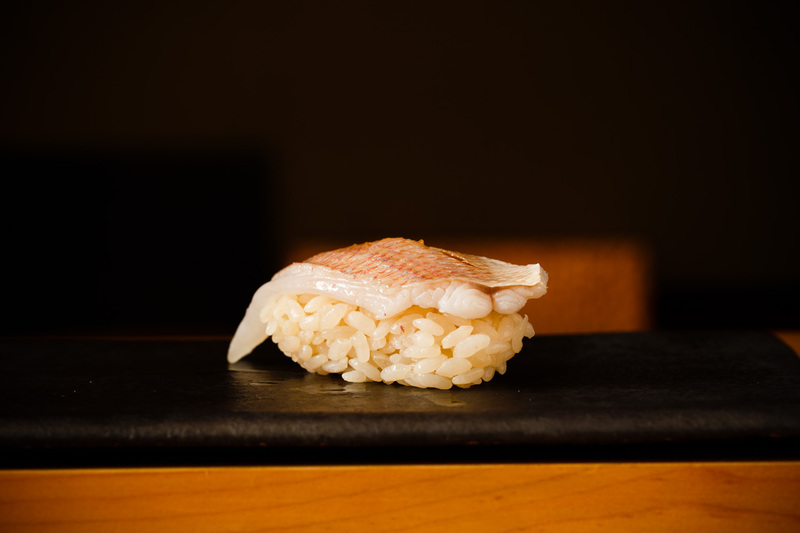 Beautifully pink-skinned baby sea bream is followed by the nigiri of thread-sail file fish that has been aged for 6 days and is served with its liver. Depending on the timing of your visit, you may experience all or none of these, but there is no question that whatever is in season at the time will be served in the most delicious form possible at Kimura. 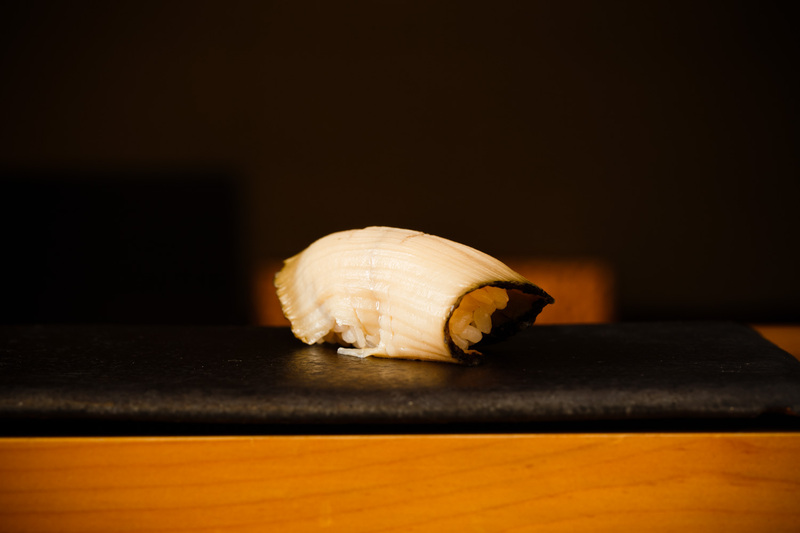 Aged sushi is a costly and time-consuming process that requires constant attention. It is a process by which the sushi is stored in refrigerators set at different temperatures over several days or weeks. Depending on the fish, the final product may be a third or even one tenth its original size, as the outer layers of the fish that cannot be used are continuously pared away. It is hard to ascertain when Kimura gets a proper sleep. Open in the evenings from 5pm, he gets straight back to preparation for the next day after farewelling his last customers around 11pm. A short nap done and Kimura is up again and bound for Tsukiji to see and touch the fish coming into market. Unlike many other sushi chefs who visit around 7am or 8am and choose from among items selected by a trusted broker, Kimura wants to choose all his seafood by himself. In this way, he can never fall back and blame a broker, taking full responsibility for his personal judgment calls. When he is pleased with his purchases, Kimura returns to the restaurant to commence preparation once again. His unconventional style does not stop at the fish, either. 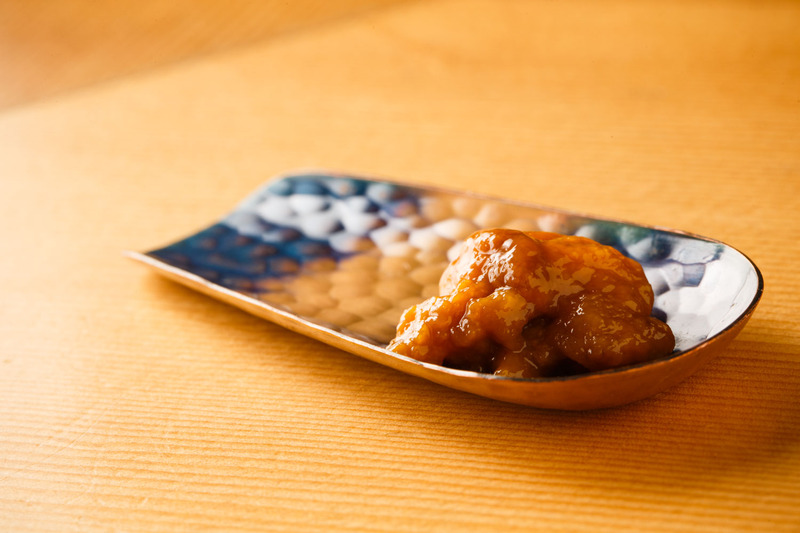 Wowed by the flavors of a three-year-aged Kyoto-produced vinegar called Fujisu, Kimura was desperate to incorporate it in his sushi rice, only to discover that the depth of flavor was dissipated by excess water from the soaking process. The vinegar merely sat on the surface of the rice. And thus, bucking all the advice from every rice grower, Kimura skipped soaking and, suddenly, the vinegar flavor soaked right through to the core. The result is a very al dente rice grain that is a fantastic contrast to the soft, aged fish. Known as the ‘Father of Aged Sushi’, there is not a sushi gourmand today that doesn’t know Koji Kimura. But the road to this point has been long and risky. Kimura’s grandfather ran a sushi restaurant in Kanda, Tokyo, but was forced to move to the suburbs after it burned down in the air raids of the war. His father eventually took over the business and in 1971, Kimura was born as the third generation in this sushi business family. As far back as he can remember, he had been allowed to use a knife, and in junior high school, he was gifted his very own for the first time. Kimura has many fantastic memories around food and recalls that even though his family was not particularly wealthy, they always ate well. He credits this exposure to foods of all kinds from a young age for the development of his discerning palate. In the restaurant, Kimura recalls how his father’s sushi brought joy to his customers, who came in anticipation of the fun and tasty dishes he always served up. He had no qualms about taking over the family business and was confident in his ability after training under his father, but felt he should gain some outside experience first. Because his mind was set about the kind of sushi he wished to produce, and he didn’t want anyone telling him otherwise, he chose to train at a tempura restaurant instead. The hints he gained from that time have proved priceless. 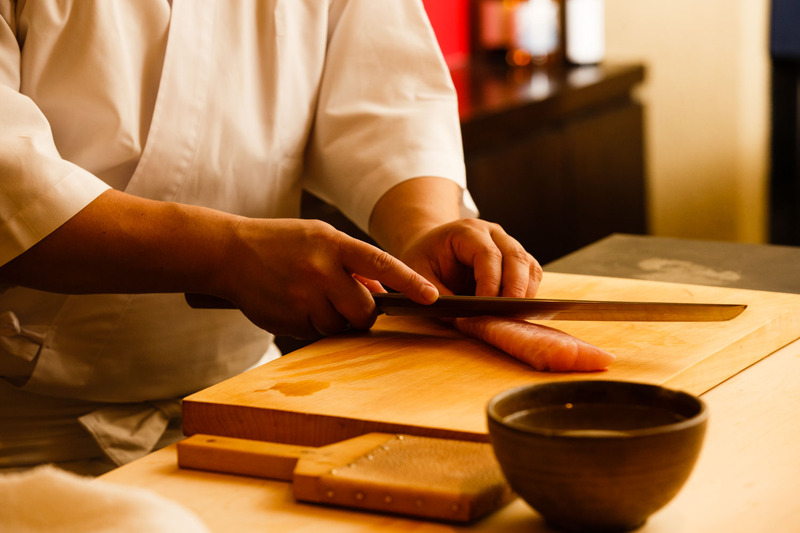 While a sushi chef makes full use of water in his cuisine, for washing and cleaning, a tempura chef preparing fish and other ingredients avoids moisture at all costs, to ensure no splashing of oil upon cooking. In 2005, after six months of tempura training, Kimura opened his own restaurant – a regular sushi place. He chose the Futako-Tamagawa area because he wanted to cater to customers who are willing to trek out to the residential neighborhood to fully enjoy the sushi experience. He didn’t want his restaurant to be a place for business and client entertainment. Denying all media attention, he chose to gather customers on his own merits through word of mouth. But when business was flailing, rather than bend his system to please all sorts, the determined Kimura searched for some key that was true to himself and would distinguish his sushi from the rest. The idea for ageing fish came to him as he lamented discarding whole blocks of his beloved white fish that had gone bad while waiting for customers. Despite having carefully chosen these pricey pieces at the market, he had to toss them in the garbage. But he grew curious about their flavor. Digging into the center flesh, which still had beautiful color, one taste revealed a sweetness he had never experienced in white fish. It dawned on him that the flesh becomes deliciously sweet just before it spoils. The only problem was the smell. Experimentation began: a new fridge, variable temperature settings, and constant assessment of how the fish and innards evolve to find the ultimate in aged sushi, sometimes with not great results for Kimura’s own stomach. But with advice from the tempura master to push the boundaries and be left with no regrets, he persevered. The discoveries he made through tireless research are now the key to his success. Kimura’s sushi is delicious precisely because it isn’t fresh – this ground-breaking new style of sushi has since earned Kimura two Michelin stars for five years in a row. Kimura feels that he has near perfected the sushi-aging technique, thus he is focusing now on refining the rice, vinegar, and other non-fish elements of the meal. He wants to revolutionize the sushi industry to focus on delivering only seasonal ingredients; he sees too many restaurants paying exorbitant prices to procure crowd-pleasers such as uni and fatty tuna, even if slightly off-season. With over-fishing, there may come a time when we can no longer catch tuna, and Kimura is determined to cultivate a sushi culture that can survive without such present-day standard varieties. 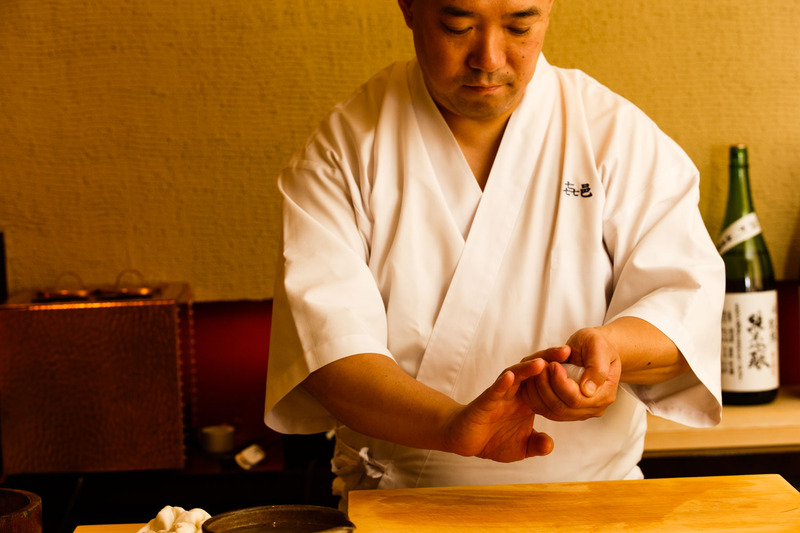 He wants to spread his philosophy that a skilled sushi chef is one who creates a value-added experience. He has an aversion to just buying good ingredients and putting a high price tag on them. He especially wants foreigners to understand this passion, which is why he has taken this opportunity to tie up with discerning TABLEALL customers. 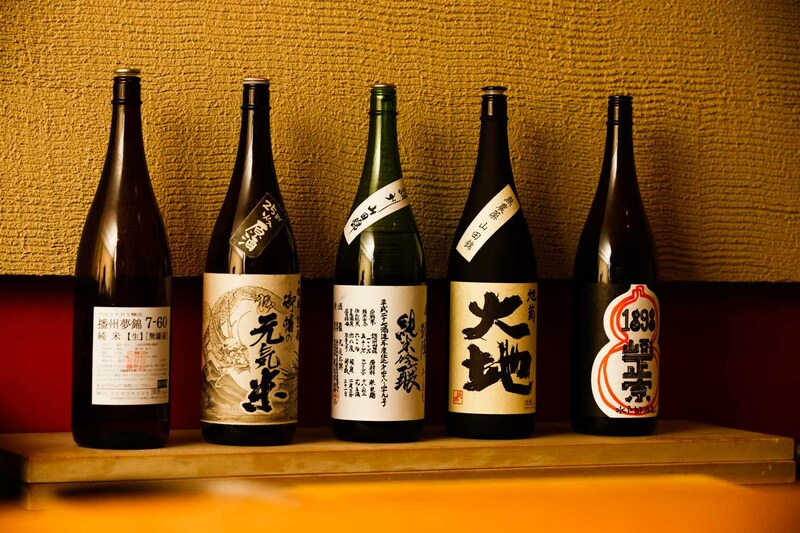 The bottles of sake along the wall strike a bold pose, with compelling labels that seem to match Kimura’s conviction. 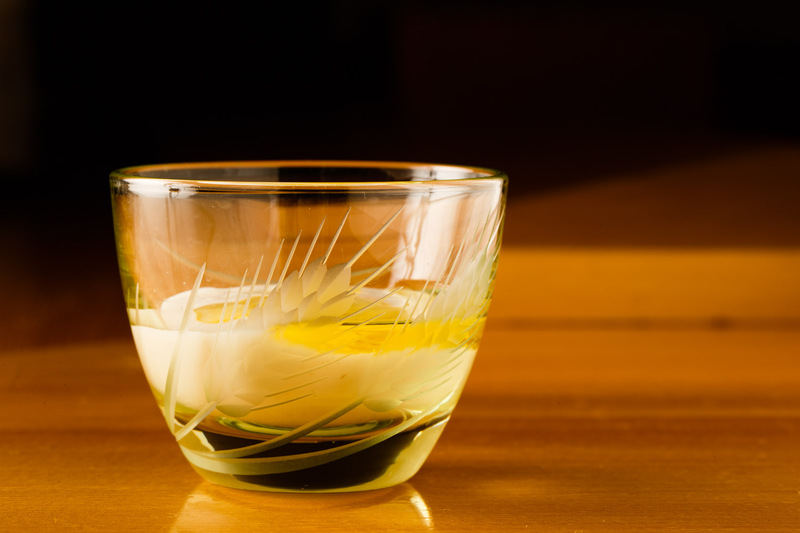 He does not serve light or easy-to-drink sake; Kimura is instead constantly searching for sake that goes beyond simply accompanying food to elevating it. He visits breweries all over Japan, only buying once he feels a connection with the master brewer’s way of thinking. 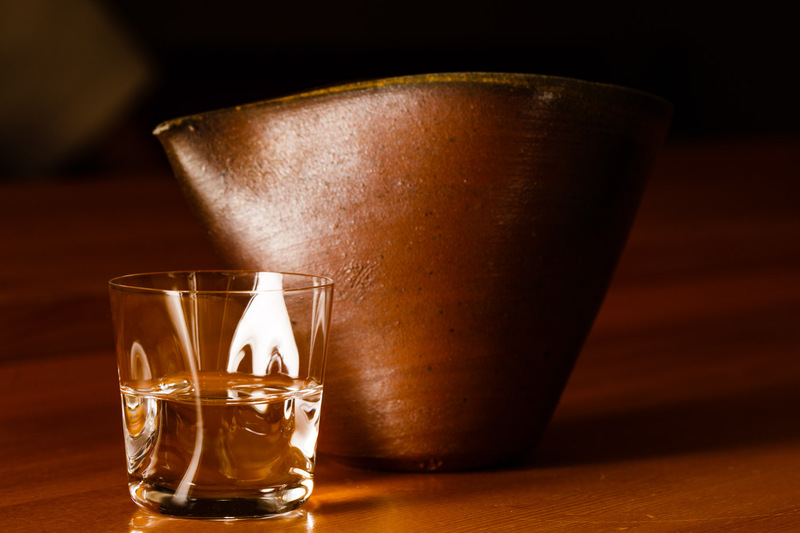 Sake is served from an earthenware pouring vessel, with beautiful relaxed curvature, into a pinched hand-blown glass cup that fits perfectly in your clasp. 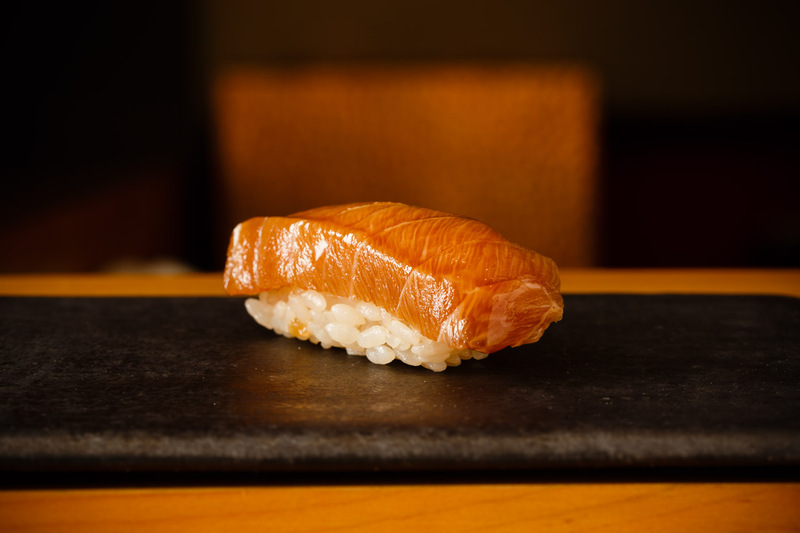 Rather than pairing with each sushi bite, Kimura asks customers to leave it to him to find the perfect matches for the flow of the meal. 2 starting times: 5:30PM and 7:30PM. Lunch on Sunday only.